Delta CEO Ed Bastian highlights long-term TechOps growth during keynote discussion. 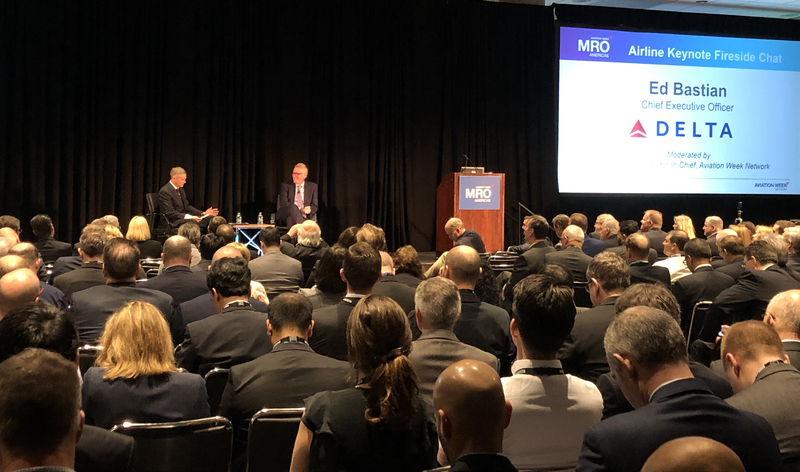 Delta CEO Ed Bastian outlined the importance of the airline's maintenance, repair and overhaul business to its long-term future Tuesday at the annual MRO Americas conference in Atlanta. The business is expected to generate close to $1 billion in revenue this year, he said, and is on a path to double that figure over the next five years. During the discussion, Ed highlighted the investments Delta has made in TechOps, particularly the new engine shop and test cell which recently opened. "These are investments in Delta's future," he said, noting that the new state-of-the-art test cell is the first built in the U.S. in more than 20 years. He also stressed the importance of Delta's workforce development to ensure a steady pipeline of new Delta people in coming years. "We're going to be hiring 500 AMTs just this year," he said. In addition to TechOps-specific initiatives, Ed discussed a range of topics during a keynote Q&A moderated by Aviation Week Editor-In-Chief Joe Anselmo. When asked about the impact of the grounding of the Boeing 737 MAX, Ed reinforced that Delta does not fly any of the aircraft and has not been impacted, but said he was "very confident" Boeing will solve issues related to the aircraft. Ed also said that he is interested in the development of Boeing's proposed mid-market aircraft, noting upcoming retirements of 757 and 767s over the next decade. Additionally, Ed discussed the popularity of the new A220 since its launch earlier this year, the performance of the Monroe Energy oil refinery, and Delta's commitment to reducing emissions and promoting environmental sustainability. "It's important that we be a good corporate citizen," he said. "It's part of our values and at the same time it's also good for our business because more and more, that's what our customers are expecting."